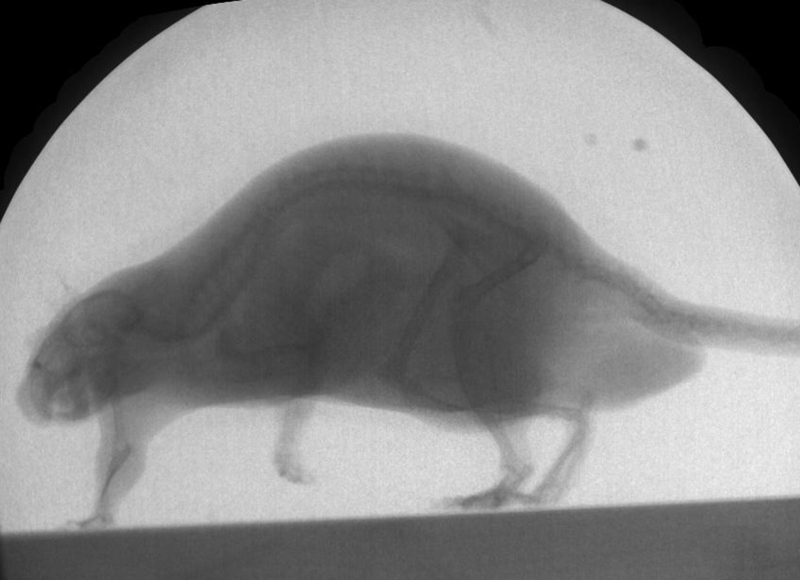 Harry, one of the rats in our trials, walking through the X-ray beams. The past week at Brown University’s C-arms XROMM lab was so busy I haven’t had a moment to post about our research experiences until now. If you’re just catching up, please see my previous post on our setup. This was certainly a new but fascinating experience both for me and my student, Radha. 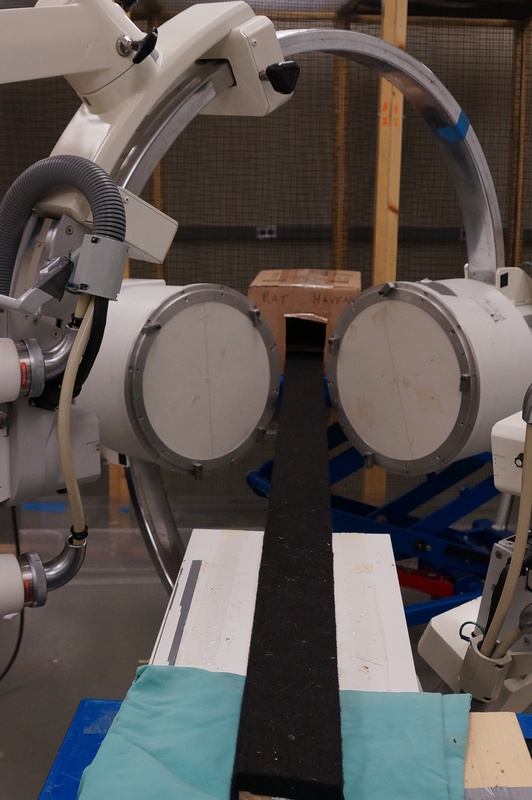 With help from Dr. Beth Brainerd and Dr. Angela Horner, we learned how to coax the rats to walk a plank of wood between the two X-ray emitting “cans” of the positioned C-arm fluoroscopes. At one end of the room is a bank of two computers connected to each high-speed camera and C-arm. When the rats were doing what we were interested in, a push of a floor pedal turned on the X-rays and recorded the ensuing stream of images which were then converted into standard computer movies. Walk the plank – each rat walked across this plank between the C-arm fluoroscopes to a hidey-hole box we nick-named the Rat Haven. 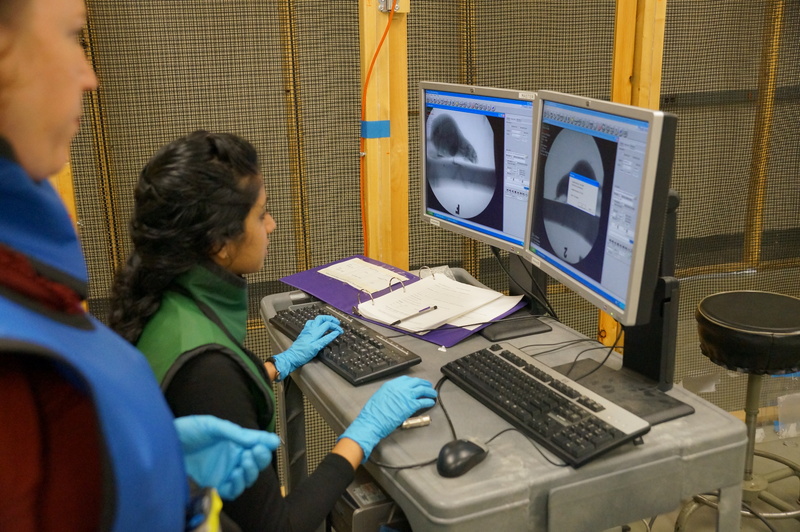 Dr. Brainerd helping Radha and I to capture the X-ray data. 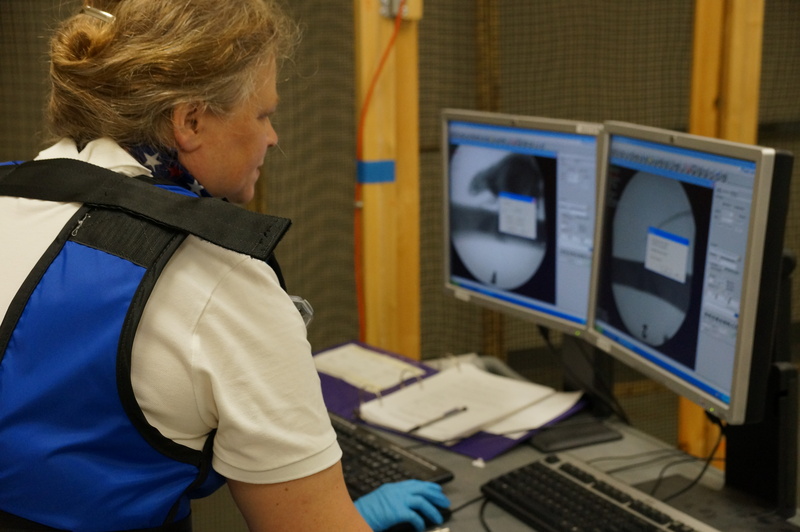 Here is Radha Varadharajan capturing and recording the X-ray movies that will be the foundation of our study. Angela Horner has been working with rats for years, and her experience in motivating these little mammals was a godsend — from Wednesday to Thursday, Radha and I learned from her experience and were able to collect loads of data that will allow us to begin reconstructing their locomotor and postural movements in 3-D. 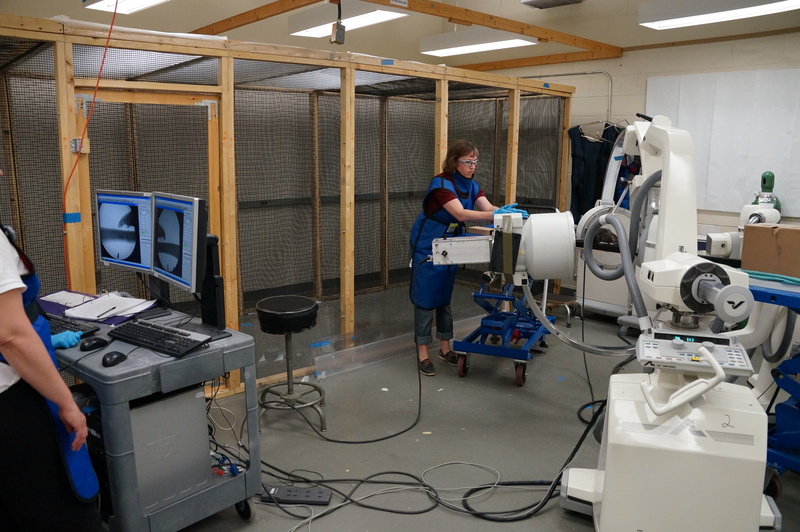 Here, Dr. Angela Horner is motivating the rat Harry to walk the plank through the X-ray beams. Radha and I both had opportunities to coax the rats across the plank to the Rat Haven as well. You will notice we named our rats. Two of them were dubbed Pink and Floyd as a nod to one of my favorite bands who also featured cartoon rats in their backdrop movie for “Welcome to the Machine.” Yeah, we’re geeky like that. 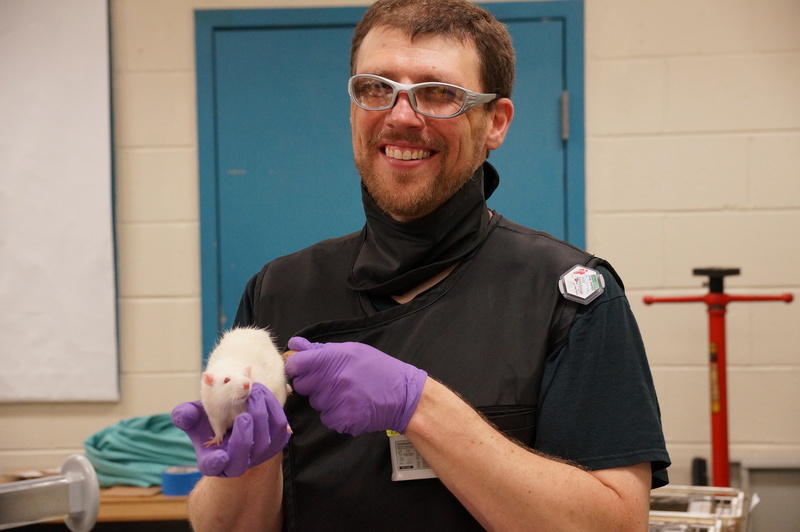 Here I am holding one of the rats we named Evan. Evan was a bit “lazy,” but ended up being great at walking a narrow dowel, helping us to see forearm movements in detail. 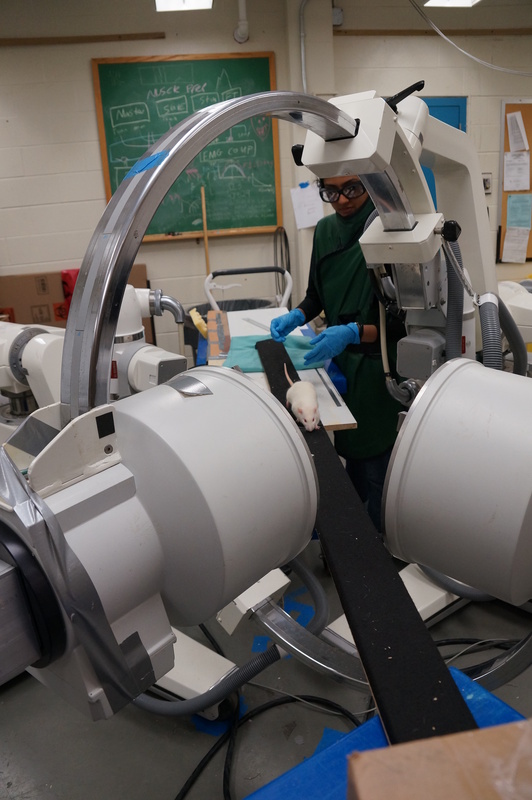 Here, Radha is coaxing Pink the Rat through the X-ray beams. Want to see a sneak-peak of the end result of our labors? Here is one clip of Harry the Rat. We are especially grateful for all the help we had this past week, and among many others Erika Giblin and Ariel Camp were invaluable in providing access and assistance with all of our XROMM issues. Thank you everyone! This entry was posted in General Goings-On, Rats, XROMM and tagged Bonnan, Brown University, Elizabeth Brainerd, Radha Varadharajan, research, Richard Stockton College, skeleton, students, x ray cameras, X-ray, XROMM by Dr. Matt Bonnan. Bookmark the permalink. Dr. Matt Bonnan is a vertebrate paleobiologist who specializes in understanding the evolutionary anatomy of dinosaurs.